Objective: To apply the croquis proportions that students have built through tracing onto vellum paper to original meaningful designs. Ask students what accessories they want to show on 3 heads. Write student requests on the board. In our case the 3 accessories were earrings, hats, and flowers. Next ask what is the theme or fashion statement of the accessories. 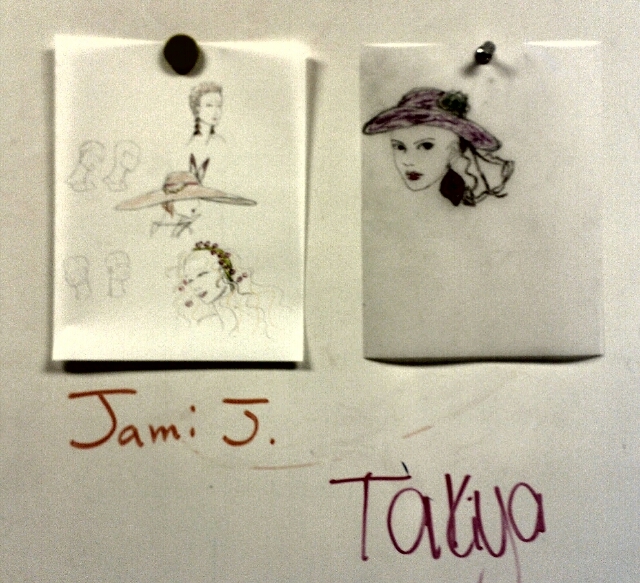 Our students suggested that the hat show Richness, the earrings be Ethnic, and the flowers symbolize Joyfulness. I wrote the name of the accessory and its theme on the board and gave students 5 minutes to create 3 heads showcasing the accessories and representing the themes. Put the drawings on the whiteboard with magnets and discuss the different approaches of the different students to the challenge. 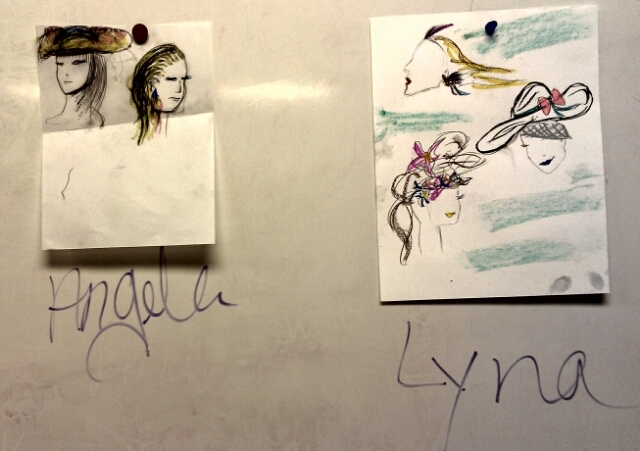 The student drawings are shown above. This activity shifts the focus off the croquis and the proportions and details of hair to the accessories. These drawing details are worrisome to many students. When we shift away from the figure, students relax and draw fashion figures with more freedom than when we focus only on the figure and its proportions. Integrating the croquis proportions into the student skillset is successfully done by alternating the figure work with decorating the figure with student-selected fashion ideas in a playful way. Tracing and coloring build confidence. Adding the fashion story shows students that there are many ways to tell any given fashion story as shown by the variety of student interpretations. 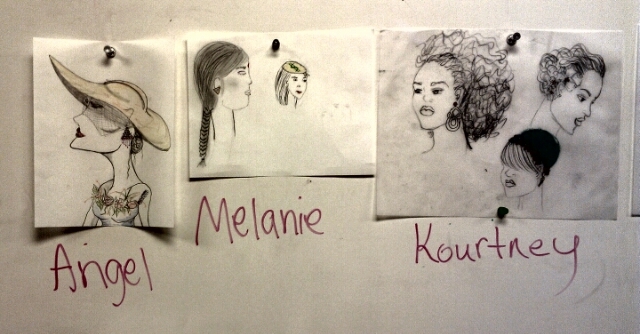 Tip: Showing a variety of fashion drawings from the library and from the Internet gives students fresh ideas.